Boneless Country Style Ribs are the easiest, meatiest ribs you’ll ever eat. Fork tender, seasoned with a dry rub and baked in the oven and you get the best boneless pork ribs ever! Currently the most popular recipe on my website is the Oven Baked Beef Ribs. 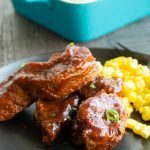 I get so many inquiries about boneless ribs so I made these Boneless County Style ribs using a similar cooking method to share with you today. I love beef ribs, oven baked ribs, short ribs, baby back ribs, grilled ribs ….. well, you get the picture. We love ribs at our house. There is something about tender lip smacking sauced ribs that we just cant get enough of. 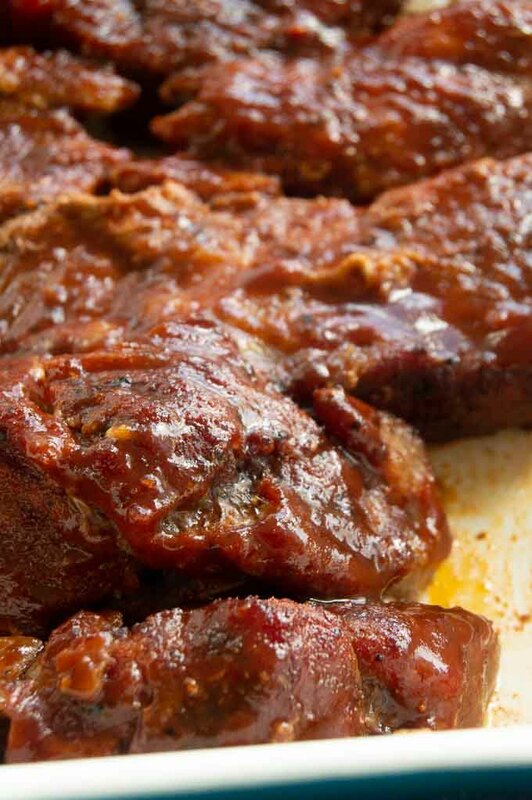 These country style boneless ribs in the oven are no exception. They are delicious, tender and meaty! Be prepared to have your socks blown off at how easy they are to make. 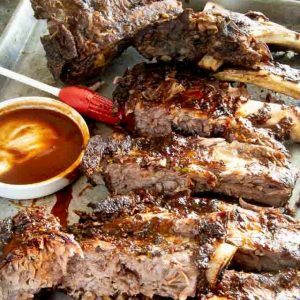 You’ll love how they have the fall off the bone tenderness just like the grilled bbq ribs recipe that uses pork spareribs and even more meat on the bone than the the oven baked beef ribs. I must be honest though… boneless ribs are not technically possible. In order for them to be ribs, they must have rib bones in them. Although Country Style Pork Ribs are called ribs they really aren’t ribs at all. What exactly are boneless ribs? What are commonly referred to as boneless ribs are really a cut of pork shoulder that is then cut into rib like pieces. The meat is super marbled for a delicious full flavor and super tender if cooked the right way….which is low and slow! You might find them at the market marked as pork shoulder country style ribs or just plain country style pork ribs. Ive also seen them marked as boneless ribs. What ever they call them you’ll really love how delicious and tender the country style ribs recipe is when you’re done cooking them! The best part about these country ribs is that they take such little effort to make them. It took me less than 10 minutes of active work time to get them ready to place in the oven. Rubbing a dry rub into them to help season the edges of the “ribs” is the only thing to do before placing them in the oven. How easy is that? I used my basic pork seasoning to season the country pork ribs. 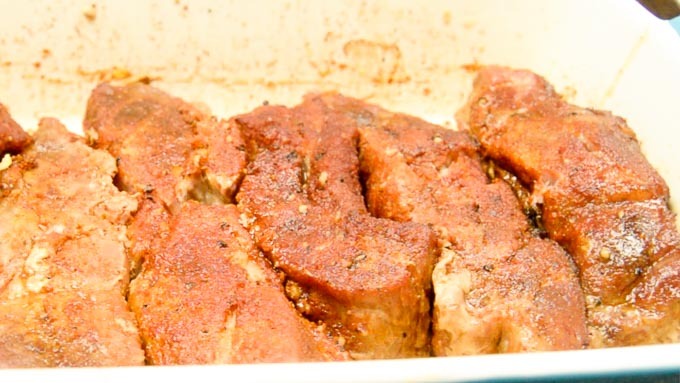 It has the right balance of sugar, salt and pepper along with some boosts of onion, cayenne and mustard that really accentuates the the flavor of the pork. Making homemade seasonings and rubs allows me to season the meats in a way that is not only cheaper than buying the prepackaged seasonings but I also know what’s in them to be able to customize them! This cajun seasoning would be amazing on these boneless pork ribs especially if you wanted to stay away from brushing a bbq sauce on them. The cajun spice rub has so many great flavors going on in it! 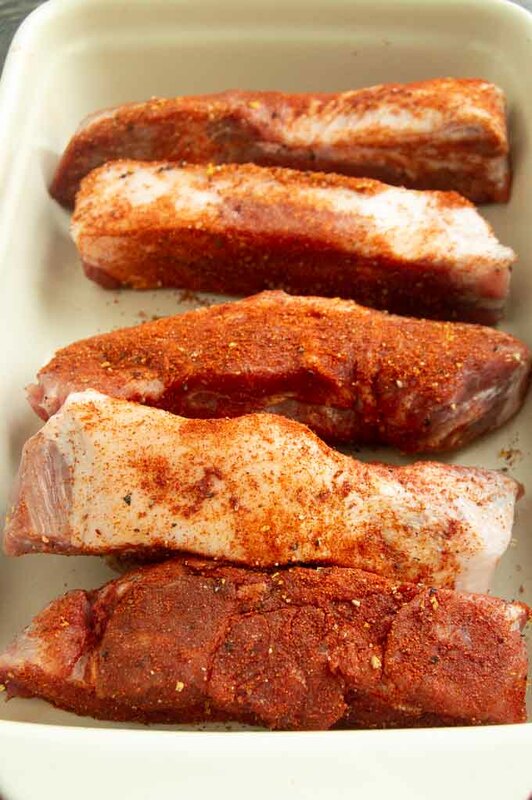 Season the ribs with a dry rub. Massage the rub into all sides of the pork. Place the ribs into a baking dish. You don’t have to worry about leaving lots of room as they shrink down during cooking. Cover with foil and place into a low oven for several hours. Once the boneless ribs are tender enough to cut easily with your fork you’ll want to uncover them and drain away the juices that have come out during the slow cooking. Not the prettiest of ribs but they sure are tender and meaty!! 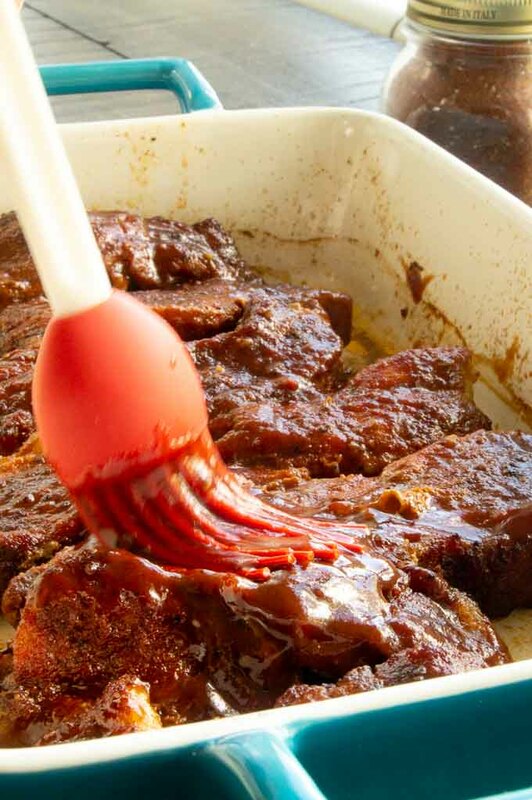 Brush the ribs with your favorite bbq sauce (or leave them naked if you like!) Then bake them for another 45-60 minutes uncovered to let them come to the perfect fall off the bone texture. Seriously, they literally melt in your mouth after letting them caramelize in this last bake. NOTE: They aren’t the prettiest things during cooking (see the photo above.) I promise you the country ribs once finished with the bbq sauce brushed on will be a work of culinary perfection. 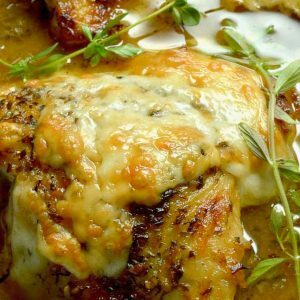 Tender, moist and melt in your mouth fabulousness! Cooking the country ribs recipe on low heat for a long time will give you boneless ribs that will literally melt in your mouth. The country style ribs need the time to break down the meat while releasing all of the juices that give it a great flavor. Cooking the ribs in the oven at a low temperature of 300° for several hours will do the trick of giving you the fall apart tender rib meat that everyone loves. Season the boneless ribs with the dry rub. Place in the slow cooker and cook on low for 8 hours. Remove the ribs from the juices and baste on barbecue sauce. You can place ribs on a sheet pan in a 450° oven for 15 minutes to caramelize the bbq sauce on the boneless pork ribs. Rub in the dry rub seasoning to all sides of the ribs. Prepare a gas grill by heating up one side of the grill to low and leaving the other side off. Wrap the ribs in foil, sealing tightly to prevent leakage of the juices during cooking. Cook on low on the side with out the burners on for 2 -3 hours until the rib meat is fork tender. Remove the boneless ribs from the foil, throw away the juices. Cook on the flamed side while brushing the bbq sauce until the sauce is bubbly hot. 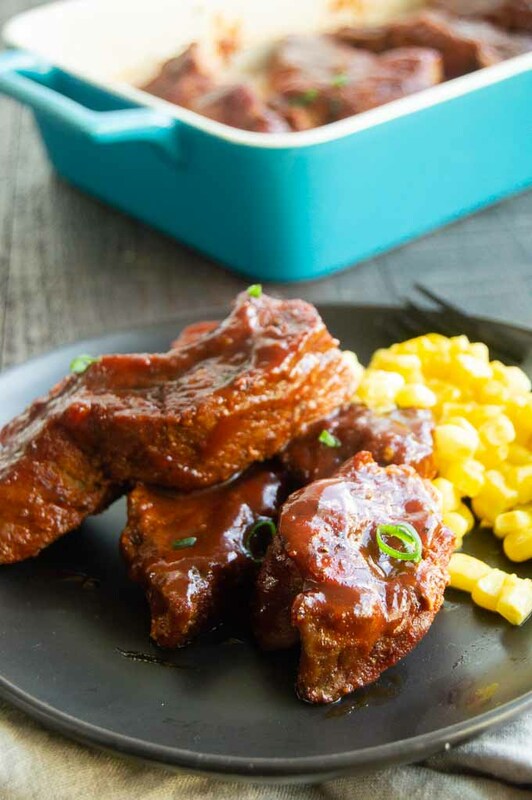 We love to have barbecues and this country ribs recipe is great for entertaining. There is so much meat on each rib that they go a long way. Figure 2-3 ribs per person as a main course. Serve them along side dishes like creamed corn or extra creamy scalloped potatoes for a filling meal. 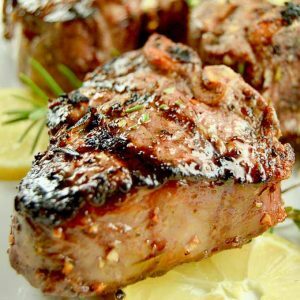 More Recipes for BBQ you might enjoy! STAY CONNECTED ON SOCIAL SO YOU DON’T MISS OUT ON THE LATEST RECIPES TO MAKE ENTERTAINING BOTH STRESS FREE AND DELICIOUS! 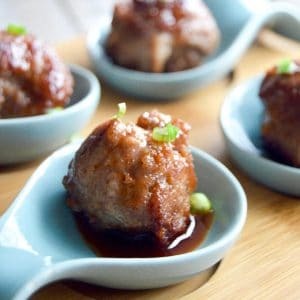 FREE TIPS FOR ENTERTAINING WITH EASE AND FUN DELICIOUS RECIPES WHEN YOU SIGN UP FOR THE MAILING LIST BELOW THE RECIPE ! Hashtag any recipes you make from West Via Midwest #westviamidwestrecipes or tag me @michele_westviamidwest on Instagram to be featured on our stories! Remove pork ribs from package and pat dry. Place into a baking dish or foil lined baking tray. Gently rub the dry rub on all sides of the ribs. Making sure all edges are covered. Remove from the oven paying special attention to not burn yourself when the steam comes rushing out. Drain away the juices/fat that has come out during cooking. Brush with BBQ sauce. Place back in the oven, uncovered, bake for 30 minutes more or until the ribs basically disintegrate when you use your fork to cut them and the sauce is bubbly and hot. Serve. If you make them ahead, you can store them in an airtight container and then rewarm them in the oven until hot. These boneless ribs are very meaty. Figure on 2-3 ribs per person for the main course. I absolutely love this recipe. The ribs turned out super tender and flavorful. The spice rub is a keeper and must be made by the bucketfuls!! I can see how I can use it in so many preparation. Will be making this again this week as my entire family asked for more!!!! These ribs were AMAZING! Fall off the bone tender, and lip smacking good. Super juicy, too!! Definitely a recipe to keep. These are delicious and great for entertaining since you can eat them with a fork.